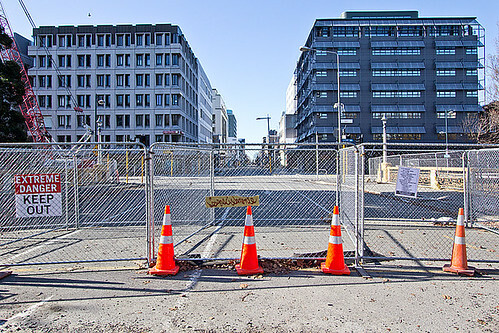 The inner city area is completely fenced off and no one is allowed in this kinda “forbidden zone”. Everything looks very scary around this zone. 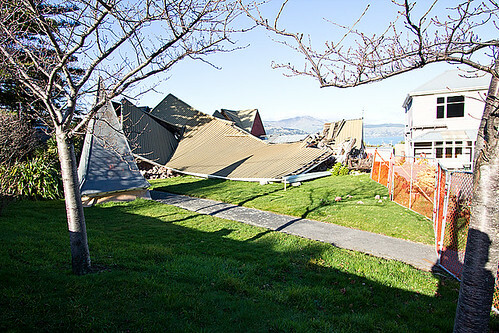 Another place that was hit quite severely was the suburb of “Lyttleton”, where I have been before the big earthquakes took place. It feels strange to come back to a place that has been in good shape on your first visit. It feels like seeing an old school mate after many years again, realizing he has totally changed. 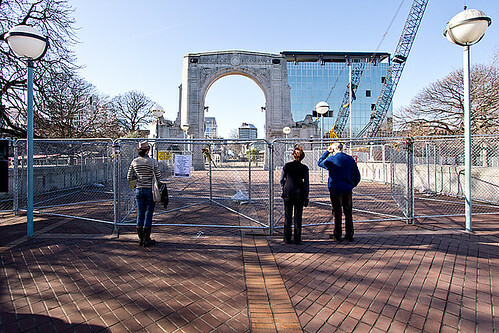 The big earthquakes of Christchurch have demanded many casualties and destruction. Many people were forced to leave their homes forever and settling in other areas of the country. 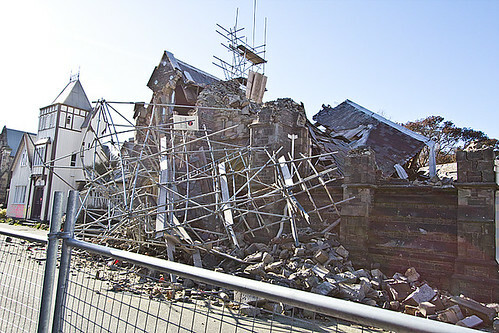 Christchurch was known was one of the most cultural places in New Zealand, but it lost many of their historical buildings, such as this old church in Lyttleton. 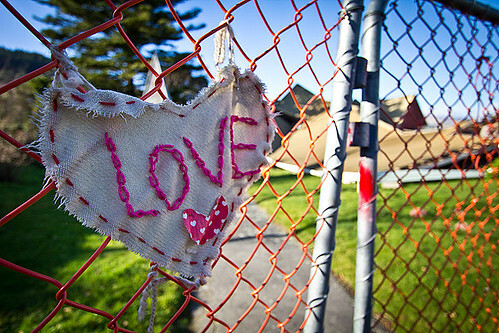 Forbidden Zone: Behind the fence lies the inner city of Christchurch that is completely fenced off. Entrance is strictly forbidden for the public. The only sign of life is a faint buzz of heavy working machinery. But maybe it was just a hungry zombie…. This area was once known as the town centre of Lyttleton, which was known as a very vibrant area with lots of bars, cafes, art and music. Nowadays it is totally forsaken, all the buildings are abandoned and the best coffee in town is sold in that red container in front of the covered house. 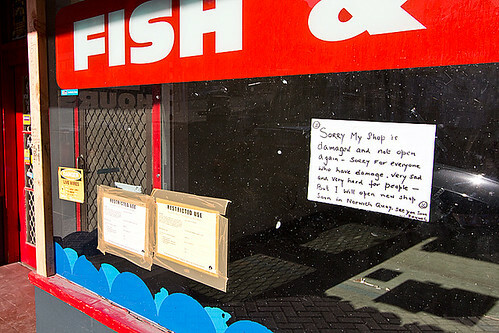 Thanks for the fish: The former owner of this fish and chip shop is saying good bye to all his former customers. His shop was declared as not safe anymore, as you can read on the stickers on the left side of the window. This building got already damaged by the first earthquake, that is why construction workers put some scaffolding around it. Unfortunately, while they were repairing it, the second quake struck the city and the whole building collapsed together with the scaffold and some workers. I don’t know if they have survived. 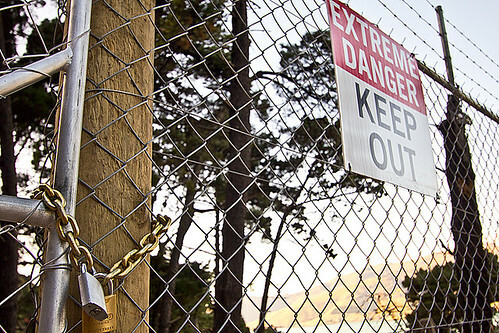 Extreme Danger: Welcome to Zombie Land. This is another view on the fence that goes around the whole inner city core. What might lay behind it? 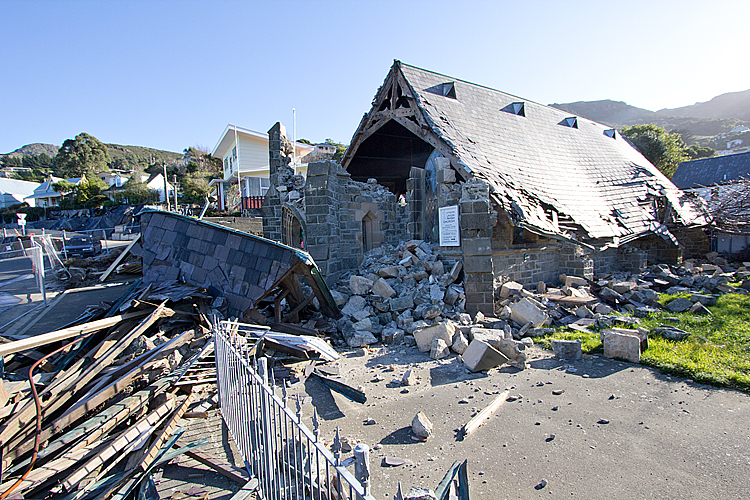 The holy trinity church of Lyttleton: The quake smashed that place completely. Nothing is left apart from the entrance and the tip of the former tower. Pretty much all churches in town didn’t survive the quake. Maybe god is not even believing in himself anymore. Lot’s of people in this area were seeking for some hold in their belief and the church after the first quake already. When everything collapses nothing but love and hope seems to prevail. Dangerous areas are heavily secured. The army has secured the inner city till mid 2011 against looters and spectators. Now that the situation got better and many areas have been cleaned up, the council is opening up the city very carefully bit by bit. 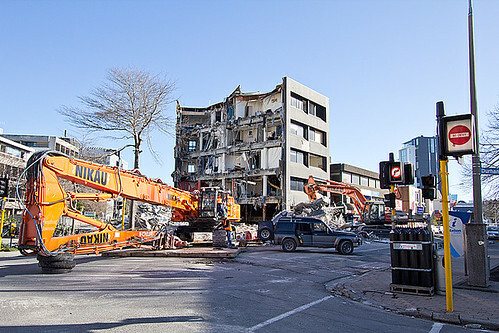 Heavy tools are required to clean up big chunks of debris. It’s hard to tell if that building got hit by a bomb or a quake. Unsafe Building – No entrance: Each building that was hit by the quake was examined by the council for damages and the safety of their structural integrity. 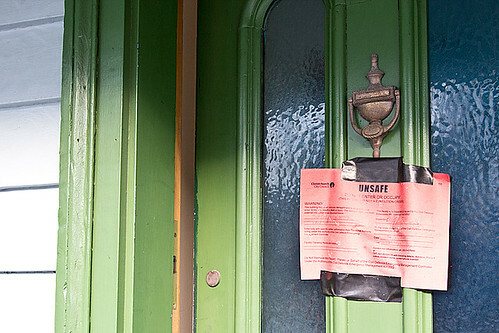 If a house got declared as “Unsafe”, the inhabitants were forced to leave and give up their former home. Sometimes you can have a quick peek inside those places. You can still see remainders of the former owners. One can feel how those people had to leave in a fearfull rush rather than well sorted. That is when the town becomes very very quite all of a sudden.